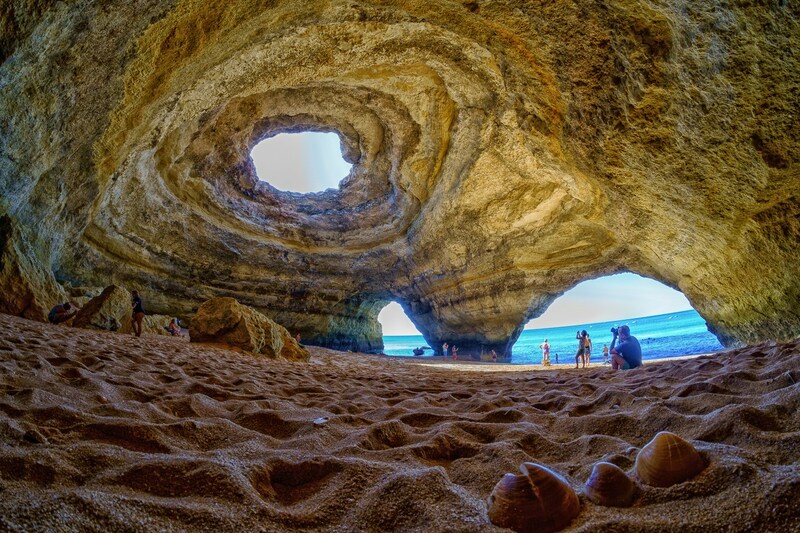 Benagil caves are one of the most famous ocean caves in the world. 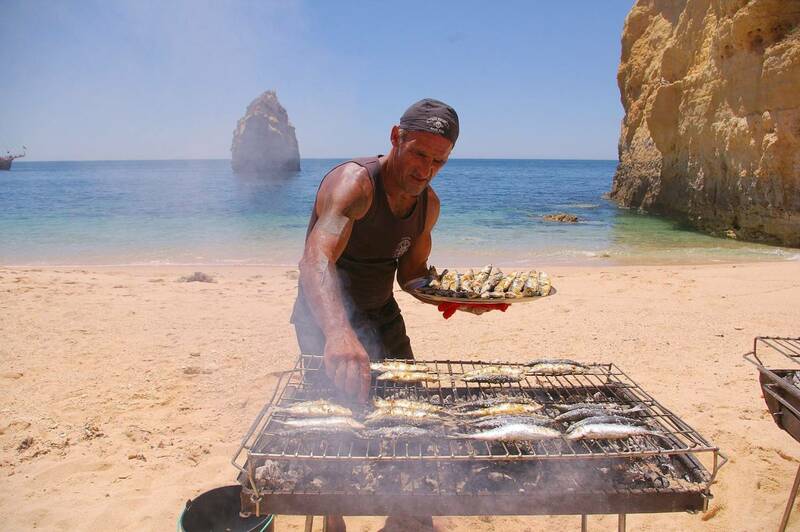 Attracting millions of tourists every year, it's the main attraction in the Algarve, Portugal. Learn the best way to visit the Benagil caves with our complete article. 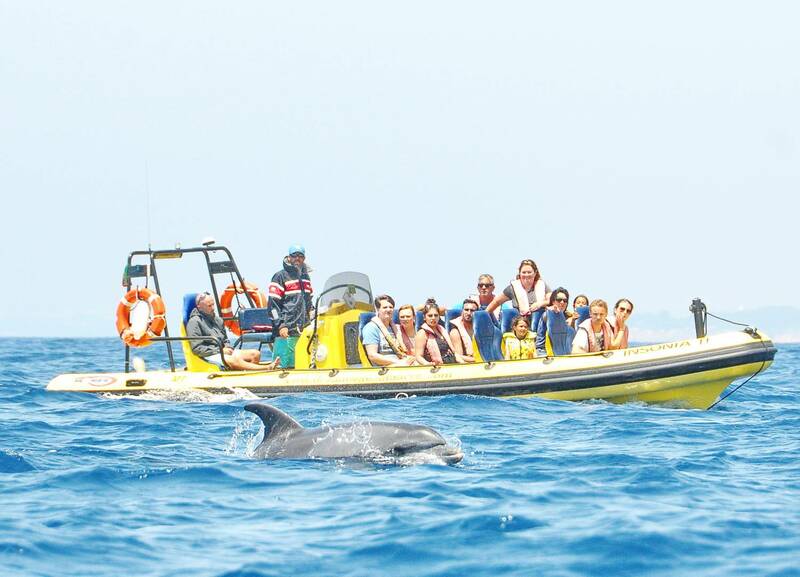 From boat tours to kayak tours to the Benagil, you will find the better option! 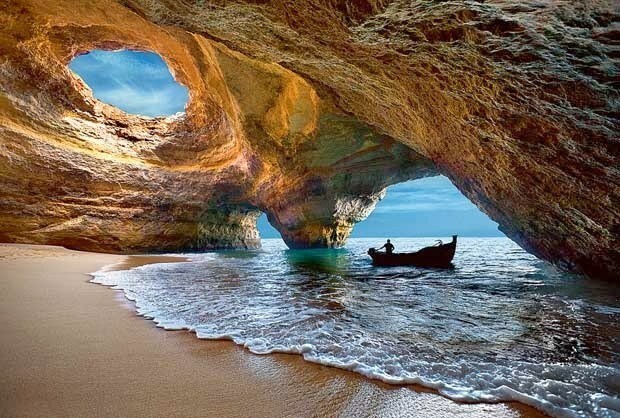 The Benagil caves are one of the greatest natural attractions in the south of Portugal, the Algarve region. This region is known for being a paradise summer land. Full of amazing beaches, high quality golf fields and the best restaurants, it is the very best destination of the European vacation. Being cited several times in international newspapers as the Huffington Post, which considered this attraction one of the most beautiful 5 places in the world, the Benagil caves are very popular. Our guide for the best ways to visit the Benagil caves (2018 edition) will help you choosing the perfect tour! The Benagil caves are in the small traditional fishermen village called Benagil, by the Benagil beach. It is located in the Lagos municipality and it’s very centrally located in the Algarve. This way, you can make a visit wherever you are staying, in Faro, Albufeira, Portimão, Tavira, Vilamoura, etc. In what concerns to reaching the Benagil caves, there are many different options adapted to each person’s preference. You can take a boat, a kayak, a stand up paddle (SUP) or even swim by yourself! However, swimming may be tricky if you do not have good physical fitness. In the peak of the summer it is also not recommended due to all the traffic of boats at the entrance of the caves. There is also the possibility to go to the Benagil beach directly by car and try your luck to get a local tour. However, you will find huge waiting lines and may loose your day when you could be having great fun in a more distant tour, which will also take you to other beautiful caves on the way. Boat tours to the Benagil caves are one of the most comfortable ways to get there. You can choose between full day barbecue trips, 3 hours tours or even the fastest tour, which last about 1 hour. In the summer time, the departure times are more frequent. However, even during the winter time you can get a boat tour that will take you to the Benagil caves. If you like speed and excitement, it’s a good idea to take a semi rigid boat. Departing from Albufeira or Portimão, you will have lots of fun and get really close to the caves. If you prefer a calmer tour with plenty of room to move on the boat and shade, while still getting inside the caves, you should opt for this tour. Despite being a not so small boat, the captain Miguel is very skilled and will take you inside all the important caves. It costs 30€ per adult and 15€ per children and you will be offered a drink on the way! It also includes a stop to swim in the ocean. What about going on a full day tour with a great typical beach barbecue? You can take a real pirate boat from Portimão, join captain Miguel and have a barbecue after his great tour, or even get into a catamaran departing from Vilamoura. If you like traditional fishermen boat and a shorter (and cheaper) tour, you better get a boat from Armação de Pêra. Having a couple of tours to choose from, you have very high chances of getting your boat trip there, specially in the summer peak. However, please notice that because of the size of the boats and the amount of boats that go to the Benagil cave every day, in this tours you are not allowed (by law) to get off the boat inside the cave. If you really want to walk on the beach inside the cave, you must go by kayak, SUP or similar. Kayaking into the Benagil caves is somehow a magic feeling. You feel closer to the nature and can decide where to go. Take a look in this post: Kayaking Inside The Benagil Cave: All You Need To Know. It is also recommended if you would like to spend more time inside de caves, since most boat tours will not be able to let you go to the sand in safety, specially in the peak of the high season. There are guided kayak tours that will take you inside the Benagil cave and many others, starting from Albufeira, Carvoeiro or Ferragudo. They vary from 2 to 4 hours, and 35€ to 65€, but are all guided and have excellent reviews. This is a guided kayak and SUP tour that starts in Albufeira, taking you to Benagil on a catamaran. SUP (Stand Up Paddle) tours to the Benagil caves are similar to the kayak tours, but you go standing over a SUP board. While the tour is more or less the same as the kayaks, you will be extremely excited with the paddling technic and will try not to fall to the water. You can be sure this is a great adventure. Costing about 55€ in the high season (1st of June til mid September), this option is a bit more pricy, but 100% awesome and people tend to love it! The stand-up-paddle tours are guided by a professional athlete. Since you are going to the most beautiful sea caves in the surrounding, you better know how to take perfect pictures inside the caves. Being a place full of contrasts between shady and sunny areas, taking good pictures can be quite a challenge! A normal camera will struggle with the high contrasts. You will need a fisheye to be able to photograph the whole cave in one picture. Even a 12mm wide angle did not really work for him. HRD technic is a good option to compensate the big contrasts. If you will take your expensive SLR, don’t forget to take it inside a waterproof bag. Now that you have all the updated information, it’s time to book your tour online to be sure you have a seat when you want. Use our Benagil caves guide and have fun! algarvebeachbenagilbenagil caveboatkayakportugal Post written by Letícia Melo. Thanks so much for this info! I looked everywhere for this 😅 I’m planning my trip to the Algarve for the summer, which month do you recommend for a family trip? When is the Benagil cave less crowded? Thanks for your questions and feedback on this post! Hi, we’re staying in Faro and really want to go to Benagil but we don’t have a car… How can we get to the village using public transportation? We will be traveling with three children, ages 9, 7 and 5. Is it possible to kayak with a small child or is a boat a better option? Hi, Kacey, thank you for your question. I personally think that a kayak tour is more fun that a regular boat tour, for all ages! The boats aren’t allowed to drop you off inside the Benagil cave and with a kayak you can! If you choose the Kayak and SUP tour that starts in Albufeira your children will be able to keep up with the tour with no stress because there’s a big catamaran to take you from Albufeira to Benagil. Just when the catamaran gets close to the cave you will get on the kayaks. Besides, in this tour each child pays only 25€ and adults 42€. I think this is the best choice for your family! Hi What is the best time of day to visit the cave? we are planning to go this friday but wondering should we do a early morning tour or late evening? Hi Milan, thanks for your question. Since the Benagil cave the most popular attraction in Algarve right now it’s always full of tourists. Without a doubt you would have a better experience on a tour early in the morning, when the sea is calmer and there are less tourists. At the end of the day it’s also with not so many boats and tourists, but sea conditions may be worse. At midday it’s too crowded, not recommended. Hi , This is Shan . I will be in Albuferia on 27th Aug and 28th Aug 2018. I wish to visit Benagil cave and want to spend some time inside the cave. What is the best option of tour available where I can get down from the boat or kayak, spend a hour or two and go back to other places. Hi Shan, thanks for your question! Usually the best tours only take you to spend some time (about 15 to 30 minutes) inside the Benagil cave. You’ll see that this time is more than enough to take good photos, enjoy the view, the beach and the vibe. 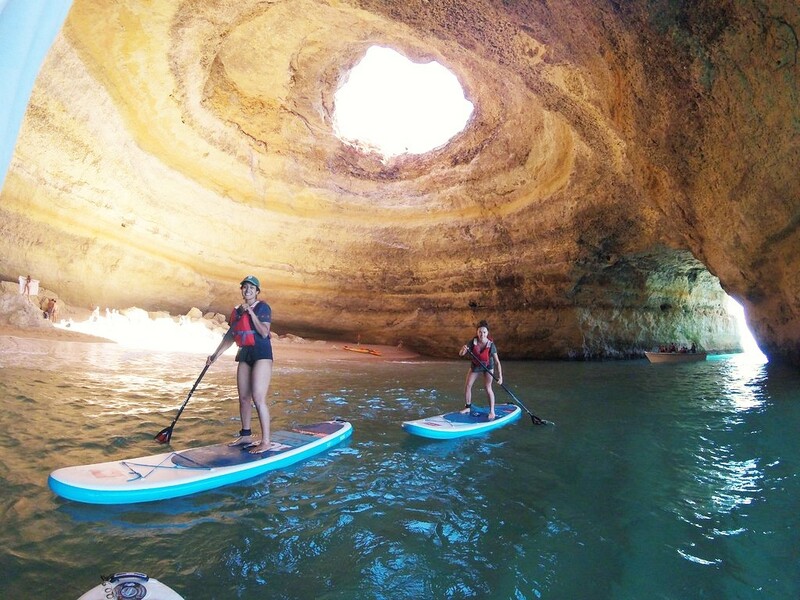 Another choice is to rent a kayak and go for yourself, but you wouldn’t be able to discover the other amazing sea caves (some even better than Benagil) that are hidden in the coast of Algarve, and that only the local guides know where to find. Fiz um passeio de barco a gruta agora em julho. Realmente é linda, mas não podiamos sair do barco, só depois em um outro momento no oceano por 5-10 minutos. Fiquei com água na boca ao ver umas pessoas na areia da gruta. Queria estar na areia dentro da gruta por um tempo. As únicas opções são o caiaque e padle ou tem algum caminho por terra, de carro que me deixaria por trás? Penso em voltar lá. Obrigada. Então a melhor forma para entrar na gruta, mesmo, pisar na areia e relaxar na praia, é com kayak ou SUP. Não recomendo que você nade sozinha para a gruta. A distância parece pequena mas é cansativa, e principalmente, não é nada seguro nadar para lá nas horas de pico durante o verão. As entradas da gruta ficam cheias de barcos e nem sempre os banhistas são vistos. Por isso um kayak ou SUP é mais seguro, e melhor ainda se for em um grupo guiado. 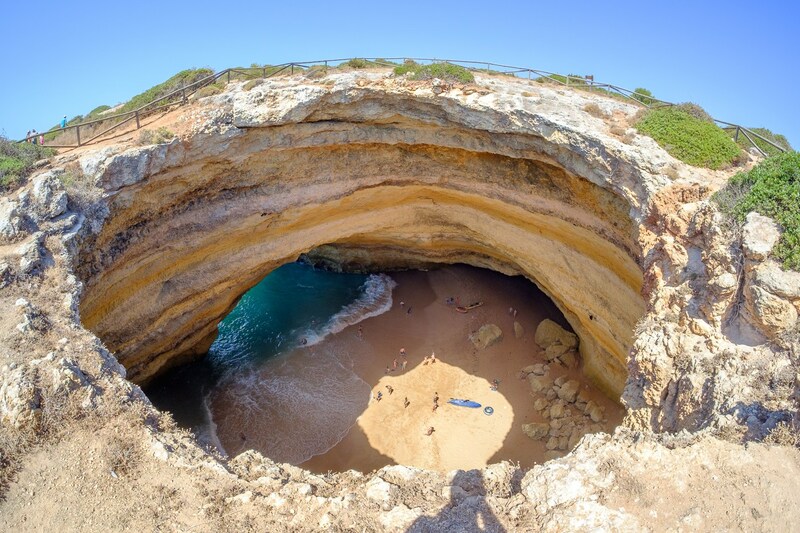 Seja como for, a gruta do Benagil é um must see pra viagem no Algarve!